Autumn and Winter bookings are now open, and with the cooler weather comes a perfect time for family portraits! Popular locations will have less crowds, sometimes we may even have a beach or park all to ourselves! The light is softer and less contrasty this time of year, giving you beautiful glowing skin. PLUS: Autumn and winter are perfect for bringing in deeper richer tones in your family session outfits. 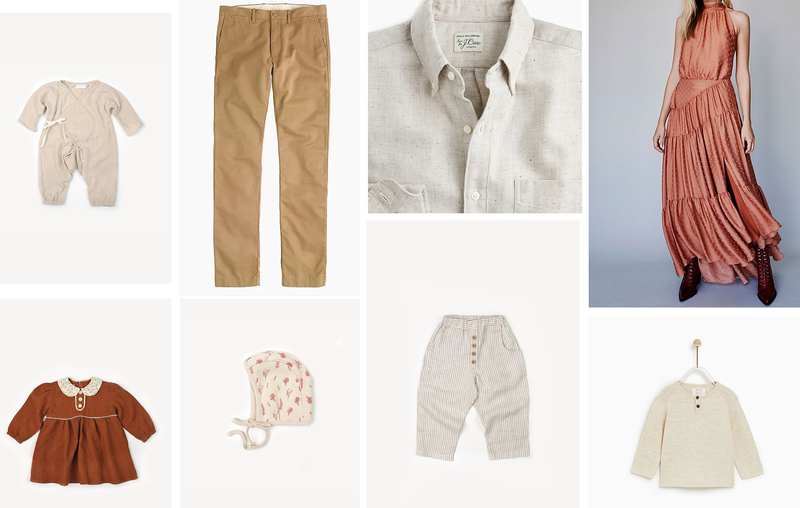 Some colours we love and recommend are rust, caramel tones, mustard balanced with cream, oatmeal and pale grey colours. For girls, a dress and thick knit stockings is an adorable choice, and with boys, woollen pants with a long sleeve henley tee (adding cute suspenders for toddlers) works really well. We have added some adorable knit rompers for sitter baby sessions in studio recently, as well as some beautiful dresses for mums with lovely textured fabrics and rich tones. Some of our favorite brands to check out for cooler weather outfits in beautiful hues and textures are Zara, Country Road, and Lover LOOK BOOK COMING SOON:We will be putting together a look book soon with all the available wardrobe options from our studio wardrobe, to make your session planning that much easier!